What a wonderful surprise I got from Gallit Zvi when she asked me to co-moderate a Twitter chat about #geniushour. We have both experienced this transformational approach to learning with our students, so we were excited to see if others wanted to talk about their experiences or had questions about genius hour. We chose a day–March 7, the first Wednesday of the month–and a time–6 p.m. Pacific Time and 8 p.m. Central Time, Gallit’s and my timezone, respectively. Then we advertised a bit, and waited for the time to roll around. We wondered if anyone but us would come. We sat for a minute or two and wondered some more. Hugh, a committed genius hour teacher, wasn’t able to be there, but he had submitted his thoughts about genius hour an hour or two before the chat. It was nice to have something to get us started. Gallit created a #geniushour wiki for all of us to share information and archive our tweets. Based on the feedback at the end of the chat, I think we all learned from and enjoyed it! I enthusiastically learned and enjoyed. I had two significant takeaways, which will change the course of my school year. In my classes we will now be having genius hour once a week, quite possibly due to this question Gallit posed. I will let students continue working on projects until completed, as Joy does with her students. Instead of presenting after every genius hour, which has been my practice, now each person can determine when s/he is ready and present at that time (or once a month). Simple ideas, but on my own thinking I had not figured these out. When I talked to others in this chat, I was challenged, inspired and empowered. My thoughts about this important idea were strengthened. If you want to read more of the tweets from our first chat, visit GeniusHour.Wikispaces.com for the archive. 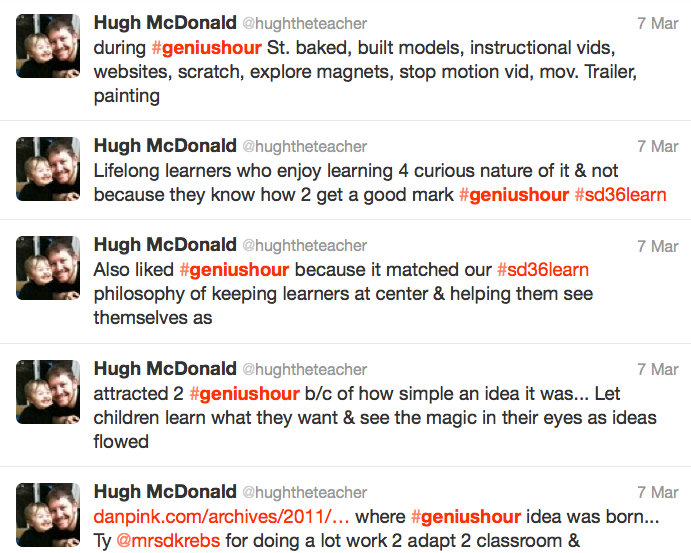 My students are happy I participated in #geniushour chat because coming up next Monday is our first weekly genius hour! I’m already looking forward to the next #geniushour chat on April 4 at 9:00 pm ET. Who knows what I’ll take away from that one? I hope you will join us! What is the premise behind #geniushour? A wonderful blog post! I wish I could have been at the chat. Next time, I will do as Hugh did and make some comments beforehand, when I am able. I am intrigued with the idea of having the students just present when they are ready. Makes sense! I have been doing it like you and found it went against our goal by the students “having” to present at the end. As we have discussed, I would love to do it weekly with my students, BUT, I only see them twice a week (for 50 minutes each class). Thanks for this blog post. I look forward to the next genius hour chat, even though I may not be there. I will be there in spirit though and will read the archive! PS My students just finished their second genius hour. They are always so excited about it and they do a lot! Genius hour was inspired by Drive, the motivation book by Daniel Pink. He does a great job of making the point that for cognitive work we are not motivated by extrinsic rewards (grades, for instance). Rather, we are motivated by autonomy, mastery, and purpose. Therefore, if we want students to become lifelong learners, we have to give them autonomy to make decisions. We have to make school a place for them to have time to master meaningful objectives. We must give them the opportunity to work for their purpose, not ours. Genius hour is letting students learn what they want to learn. I do tell them they have to be productive and creative–which is what the word meant originally (genesis, generative, genius). Some make music videos, a presentation about something they learn about, crafts, designing, building, create a new sport, etc. They can also work to improve a skill–some work on a program–photo editing, iMovie, Scratch, etc. They just master a program. Thanks for asking, Karla! I enjoy talking about it, so if you have any more questions, please ask. Thanks, Tia, for the comment and the encouraging words. It is exciting, isn’t it, to watch the passion, engagement, and learning going on during genius hour? I’ll be anxious to learn about your students’ experiences when you share them! I believe your Genius Hour is a great way to engage your students. I believe by allowing them to do what it is they want to, you’re actually allowing them to be creative, share their ideas and thoughts with each other. Thanks for your comment. There is something profound about genius hour. I’m figuring out something new every day about empowering students and facilitating learning. It is an exciting time to be in education!